35mm (30.0g) .900 fine gold. Numbered 1211/1250. Moshe Dayan and Yitsak Rabin in front of the wailing wall/ Israeli special forces insignia. Central American Bank gold 50 Pesos 1970, ( 20 grams, 900 Fine.) KM-X1, Struck to mark the 10th anniversary of economic integration. mintage of 1500. Mimics the design of the Central American Replublic escudos. 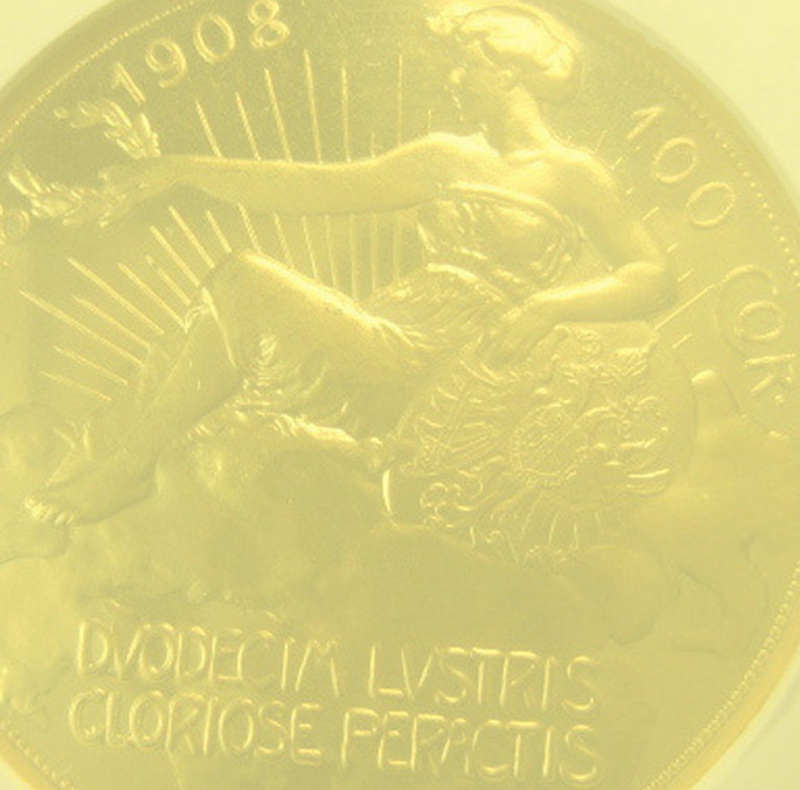 1897 Pattern Talari (Thaler) Proof Gold restrike from the silver pattern dies. (40.2g.) KM X1 Amharic legend: "He is the Conqueror, the Lion of the Tribe of Judah, One Birr" Extremely Rare. Purportedly from a mintage of 10 pieces, struck by Pinches in London in 1950 to commemorate the post war liberation of Ethiopia. 4 Dukaten 1917. 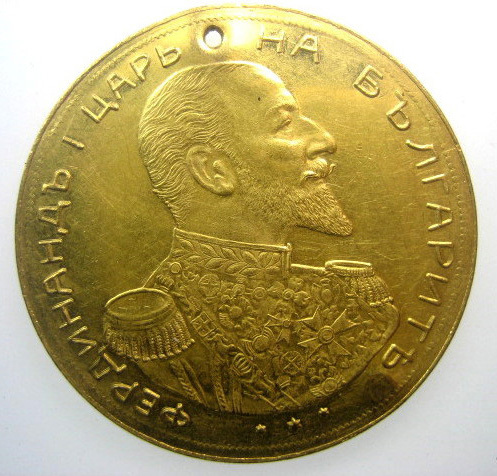 (12,65 g.) Minted the year before his abdication upon his defeat by the allied forces in 1918. Schl. 5.3.4. 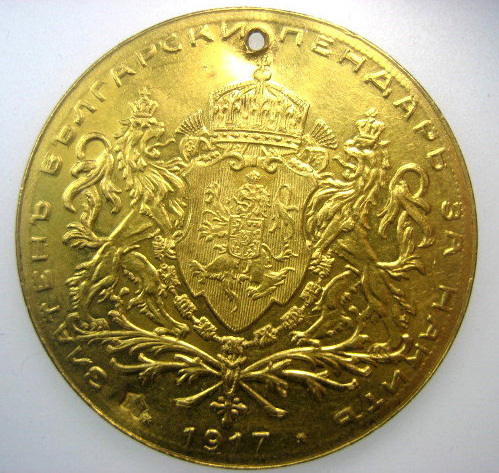 14K Gold Medal (Hallmarked pt.585 on rim with K for Kremnitz mint) (35 grams), 38mm; "Celostatina Vystava Postovych Znamok Bratislava 1937." / "Pro Filatelia" (engraved) "Arnost Berka." medalic tribute to philatalist convention in Bratislava, Czechoslovakia, the last year of autonomy before the country was annexed and partitioned by Germany in 1938-9. Benito Mussolini.Medallic/Pattern 100 Lire, 35mm (32.2g fine Gold). Helmeted bust of Il Duce l. Rv. Fasces with ax and lion's head. Rev: copy of the Vittoreo Emanuele pattern struck in 1928, Obv: with Mussolini's bust substituted for the King's.Bruce X2c. very rare. Extremely fine.............. available on request. Sycess: 1.002 gold bar struck during the Chiang Kai Shek rebellion. obv: Ancient "pu" weight, Rev: Characters (made by the central bank of China, year 4) (1.002 ozs.) Very Rare. Sycess: .992 gold bar struck during the Chiang Kai Shek rebellion. obv: Ancient "pu" weight, Rev: Characters: (made by the Cantral Bank of China, year 4) (.992 ozs) Very Rare.